The beach and ridge at Babalua Beach, Providenciales. Although centrally located, this location doesn’t see many visitors. The beach is decent, but the water tends to be shallow, with the occasional rock or sea plant. Interesting snorkeling can be found farther out. 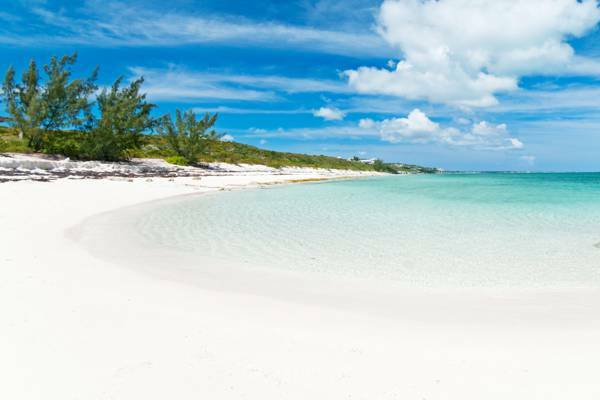 The beautiful Babalua Beach, Providenciales. Located between Turtle Cove and Thompson Cove, Babalua Beach (sometimes referred to as Blue Mountain Beach) is often overlooked by many. The ocean here doesn’t offer as pristine swimming conditions as Grace Bay, The Bight and Leeward do, but the area is a bit more secluded while still being easy to access. 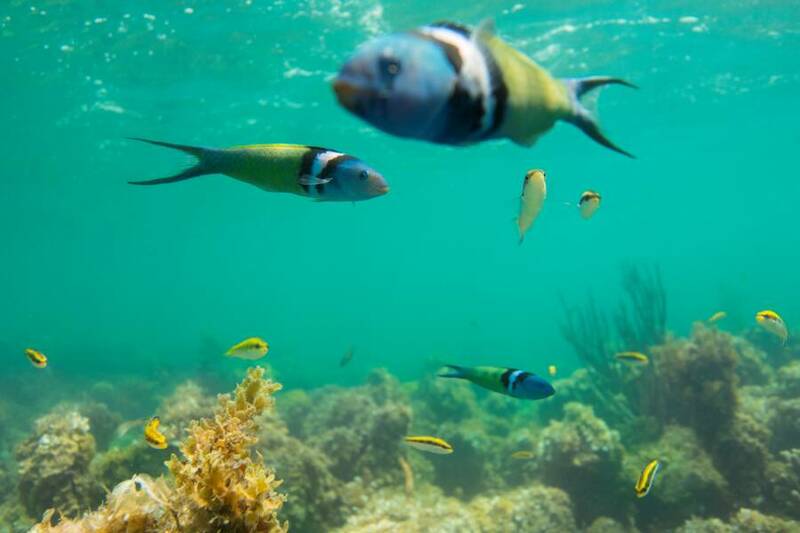 Bluehead Wrasse at Babalua Beach, Providenciales. Babalua Beach is about 3000 feet (900 meters) long and because it’s bordered on one side by the channel into Turtle Cove Marina on one side and sea cliffs on the other, it’s not possible to walk along the coast to other beaches. Great snorkeling can be found 1400 feet (425 meters) down the beach west from the main access, but the easier to find and more expansive nearby Smith's Reef probably makes more sense as a snorkeling site. The water depth in the area is generally quite shallow, and sea grass beds occupy much of the water off the beach. In addition to the small reef near the Babalua Beach access, another larger reef system can be found a bit further down the coast and near the ocean cliffs of Blue Mountain. Babalua Beach is part of the Princess Alexandra National Park. Babalua Beach only has one public access, which is found by following Cherokee Road from Leeward Highway to its end. The access is hidden on the far side of the large villa. Turtle Cove Marina is located here, and there is a small threat to swimmers from vessels entering and leaving the marina. However this isn’t much of a concern due to the no-wake speed limit enforced, and the narrow entry lane into the marina. The main access for Babalua Beach. Found at the end of Cherokee Road off of Leeward Highway. The access is hidden behind the large boulder at the base of the cliff at the termination of the road.